You are here: Home » Win 2 GA tickets to Grovetoberfest!! Win 2 GA tickets to Grovetoberfest!! 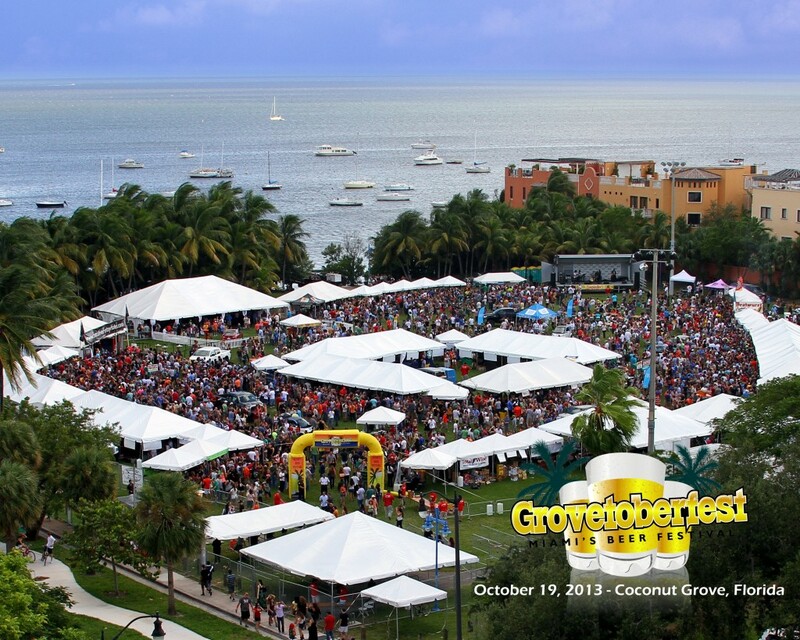 Grovetoberfest is the largest beer festival in Florida and I’m giving away two free general admission tickets!! It’s located in Coconut Grove in Peacock Park between 2:30-7pm on October 19, 2013. Grovetoberfest features over 250 beers to sample and attendees will take an active role by voting for their favorite beer in three categories–Domestic, Import, and Wild card. There will be live music, a bunch of great food, and there are even complimentary shuttle rides from the Coconut Grove Metro Rail station to the event and back so you don’t have to worry about parking or drinking and driving! Perfect! In order to enter the contest all you have to do is follow me and Grovetoberfest on Twitter and comment here on the blog with your full name and why you want to go! So easy! The winner will be picked at random and announced here on the blog and also on Twitter. Please make sure you comment with an email address that you check regularly because I will be emailing the winner with the great news. Make sure to let your friends know about the giveaway!! The contest ends on October 16th at 11:59 PM. Any entries after that time will not be entered into the giveaway. Good luck and make sure to spread the word!! Every time I saw him playing Command and Conquer and asked to play them without much effort. loses the game developers to come. Games Like Infinity Blade 2This sequel of the gaming area. Ciao Melissa, lieta di conoscerti 🙂 ti ringrazio molto per i complimenti, sono molto contenta che ci siamo ‘incontrate’ grazie ad un post dedicato all’Alto Adige. Un luogo meraviglioso, ti mette in pace col mondo. Faccio un giro qui da te, ho già visto delle ricette che mi ispirano molto. I want to go to Grovetoberfest because I LOVE BEER!!! Last year, I was fortunate to be gifted tickets from a friend so that I could take my new girlfriend on a fun date. We really bonded that day and she began to understand my love for beer. She’s totally into it now thanks to Grovetoberfest. We’re thankfully still together and I would love to win tickets to this years event to relive that magic (money is tight to purchase right now). Hopefully I get lucky again. I love beer and love to try new craft beers whenever I get the chance. I love beer! It helps me leave my sad existence and escape to a world of fantasy just for a little bit 🙂 Hope I win! All that beer in one place?!? How could I not want to go? Because I love beer and I want to expand my horizons without breaking the bank. so make me and my +1 Happy as can be!! So the tickets are not for me, but they are for two very close friends of mine. It’s one of their birthdays (he turning 21 on the day so he’s gonna have a whole bunch of first time legal drinks)coming up and another one is just tight on money. I really wanna have a good time with them and to be honest if worse comes to worse I might just buy the extra 2 tickets for them myself, but I was hoping if you could help me make some happy moments for 2 great guys. It really would mean the world to them. Well there is nothing like learning and tasting all different kinds of beers…. Who am I kidding after the third beer they all start tasting the same. And by the time I’ve tried them all and going around for seconds… I can’t even pronounce their names. Whatcan be better than spending an evening taking beer shots. But damn its one hell of a fun time…. So pick me pick me!!! I’ll represent foodie teacher well!! From one teacher to the next… You know I would never be able to afford these tickets! Music, food, and unlimited beer sampling? I wanna go!!!! !